My partner in life is a Jew, one of my sons is gay, another is an anarchist, and I am a left-wing feminist as well as a daughter of immigrants. If Golden Dawn comes to power our only problem will be which wagon they will put us on. 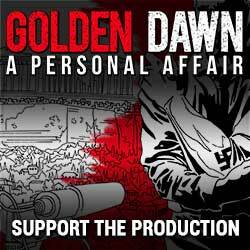 A journalist is delving for years into the organization of the Greek neo-Nazi party “Golden Dawn”. Ilias Panayiotaros – Golden Dawn M.P. Shots from the evening of the elections of May 6 2012 were filmed by Nicolia Apostolou for the film “DEMOKRATIA, CHEMIN DE CROIX” by Marc Gastine, produced by Minimal Films.